Breaking news has not been kind to the fossil fuel industry recently, nor to the federal and provincial leaders endorsing new pipeline projects: oil industry lobbyists were outed for massaging data to push bogus claim Canada needs more pipelines; blockbuster report revealed current fossil fuel projects are on track to overshoot 2.0˚C carbon budget; Justin Trudeau was slammed for deferring action on deadly methane emissions; and UK’s eminent climate scientist has warned again that our chances of avoiding climate crisis are slim to none. So far, no one from Team Trudeau has stepped up to pick up the pieces. 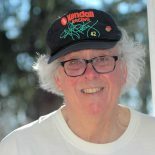 Below is a repost of Clean Technica’s short article, featuring critical comments by Jamie Henn of 350.org. Or read the article on the website by clicking on the following linked title. 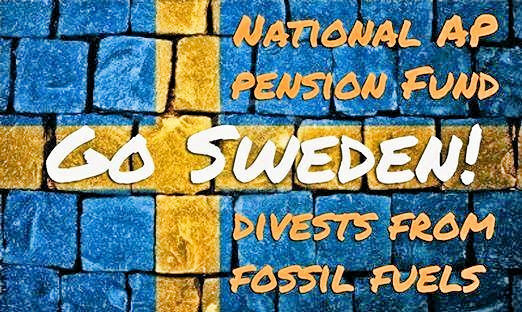 Sweden’s largest pension fund, AP7, announced last week that it had divested all its investments in six separate companies that it says had violated the Paris Climate Agreement, including big name companies such as ExxonMobil, Gazprom, and TransCanada. AP7 provides pensions to 3.5 million Swedish citizens, making it the country’s largest national pension fund. Last week, the group announced that it had divested itself from six companies it believed had violated the Paris Climate Agreement in different ways. Specifically, AP7 accused ExxonMobil, Westar, Southern Corp, and Entergy of fighting against climate legislation in the United States, Gazprom for exploring for oil in the Russian Arctic, and TransCanada for building large-scale pipelines across North America. “Since the last screening in December 2016, the Paris agreement to the U.N. Climate Convention is one of the norms we include in our analysis,” AP7 said in a statement. Somewhat unsurprisingly, the companies involved have added their own voice to the discussion. In an emailed statement to news outlets, ExxonMobil said that it respectfully disagrees with the decision of AP7, “which has not communicated to us its evaluation process. We have been vocal in our support of the Paris climate agreement, which we believe is an effective global framework for mitigating the risk of climate change.” And, to be fair, ExxonMobil has definitely loudly proclaimed its support of the Paris Climate Agreement, both when Rex Tillerson was its CEO, and afterwards, when Tillerson had moved on up in the world to be the new US Secretary of State. However, environmental groups are less forgiving of ExxonMobil’s efforts. Earlier this month, 350.org highlighted new documents from the New York State Attorney General — as part of a larger investigation as to whether ExxonMobil misled the public and investors — which showed that, while Tillerson was CEO of ExxonMobil, the company “actively misled shareholders about climate risk” and deleted “untold numbers” of documents relating to climate change — including many emails sent under Tillerson’s now-famous email alias, Wayne Tracker. More recently, ExxonMobil has found itself under mounting pressure to report on its impacts on climate change, and shareholders recently voted 62.3% in favor of such reporting. The other companies seem to be remaining tight-lipped on AP7’s announcement, but for 350.org, it’s all fair in love and fossil fuel warfare, and these companies are only reaping what they deserve. This entry was posted on June 25, 2017 by fjwhite in climate change, economic counterpower, government action, information counterpower, political action and tagged ExxonMobil, Paris Agreement, Sweeden divests from fossil fuels, TransCanada Corporation.